dry fruits laddu recipe | dry fruits ladoo recipe – no sugar, no jaggery with detailed photo and video recipe. dry fruit laddu is usually prepared during festival season like diwali, navaratri and krishna janmashtami. 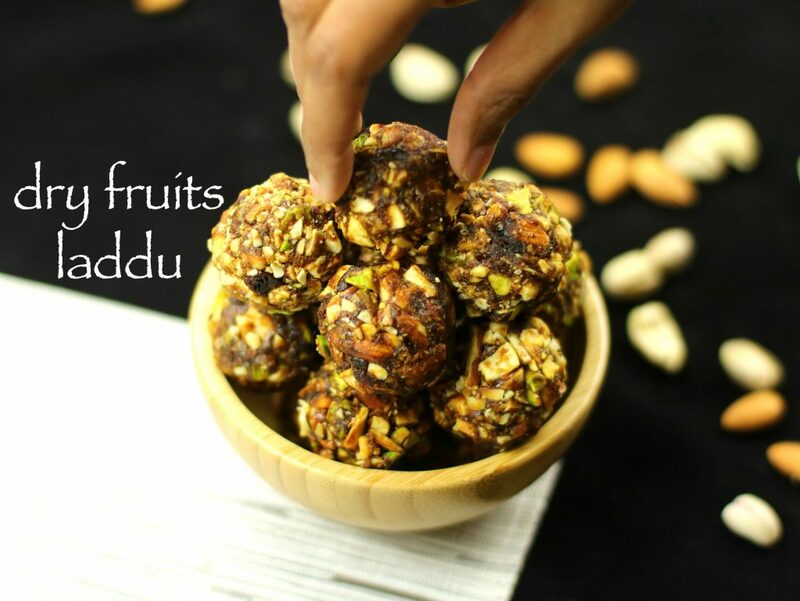 dry fruits laddu recipe | dry fruits ladoo recipe – no sugar, no jaggery with step by step photo and video recipe. 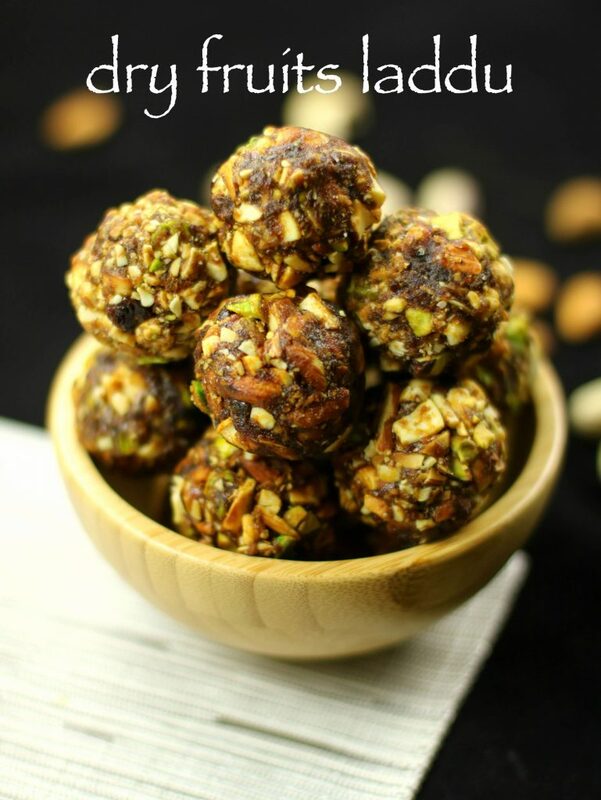 dry fruits laddu is an instant and healthy laddu prepared with only dry fruits without any sugar or jaggery. furthermore, this healthy ladoo, does not even require edible gum to form the round shape. moreover, seedless dates are coarsely grounded to act as edible gum and to give the sweetness to this amazing laddu. my husband is a great fan of sweets recipe. he likes coconut burfi, rasgulla recipe, kulfi ice cream recipe and paal payasam recipe. 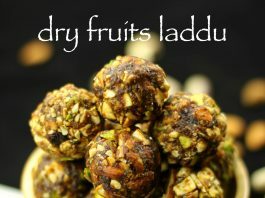 however, dry fruits ladoo is the healthiest indian deserts and most economical sweets in terms of calories. as mentioned earlier i have not used sugar or jaggery syrup in this laddu. so this laddu is ideal for calorie watchers. moreover, the water is extracted from dry fruits, this makes it as a small package of nutrients. furthermore, dry fruits are rich in vitamin e, iron, magnesium and beta carotene. i have posted several sweet or desert recipes, especially like motichoor laddu, rava laddo, kaju burfi, kesari bath,pineapple sheera, besan laddu in microwave, carrot halwa, kayi holige, besan laddo,chocolate mug cake, mango rasayana, gulab jamun, and especially milk powder doodh peda. in a blender take 1 cup of seedless dates and dry blend around 4-5 pulses. 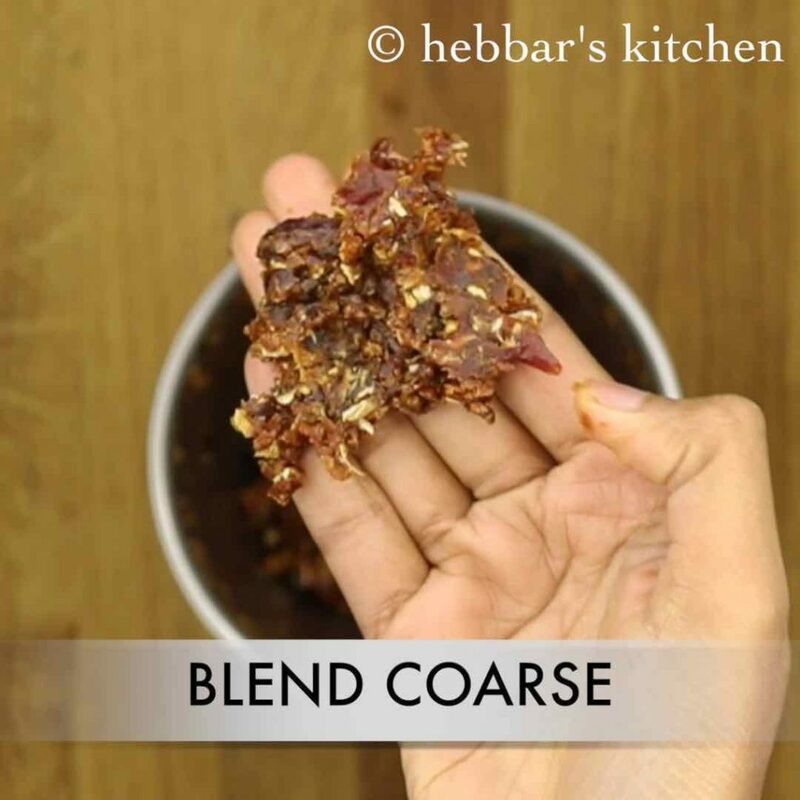 blend dates coarsely. keep aside. 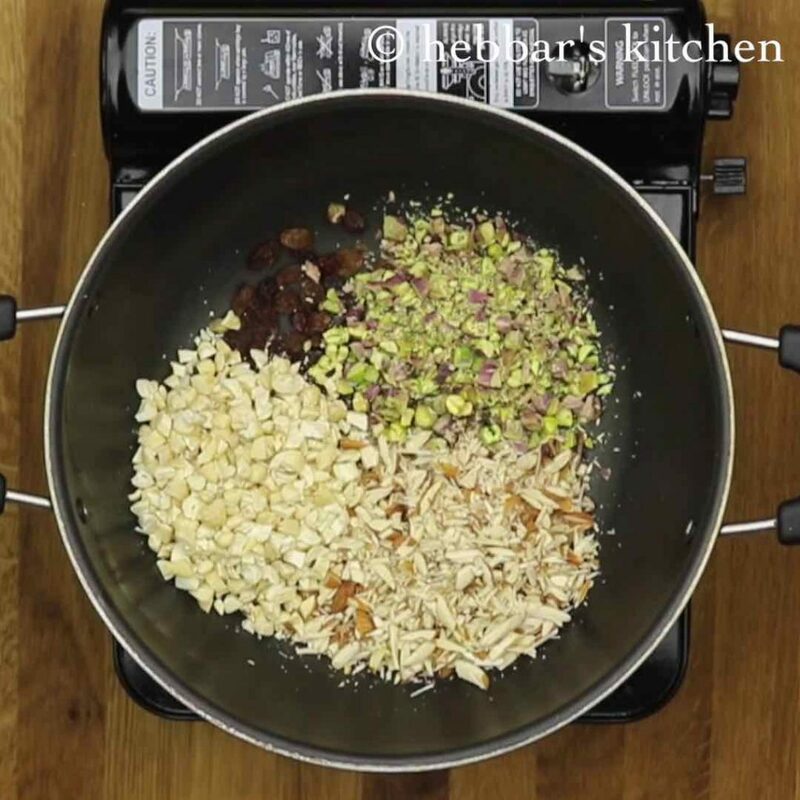 now finely chop cashews, pistachios and almonds. do not powder them as you wont enjoy the crunchy bites. 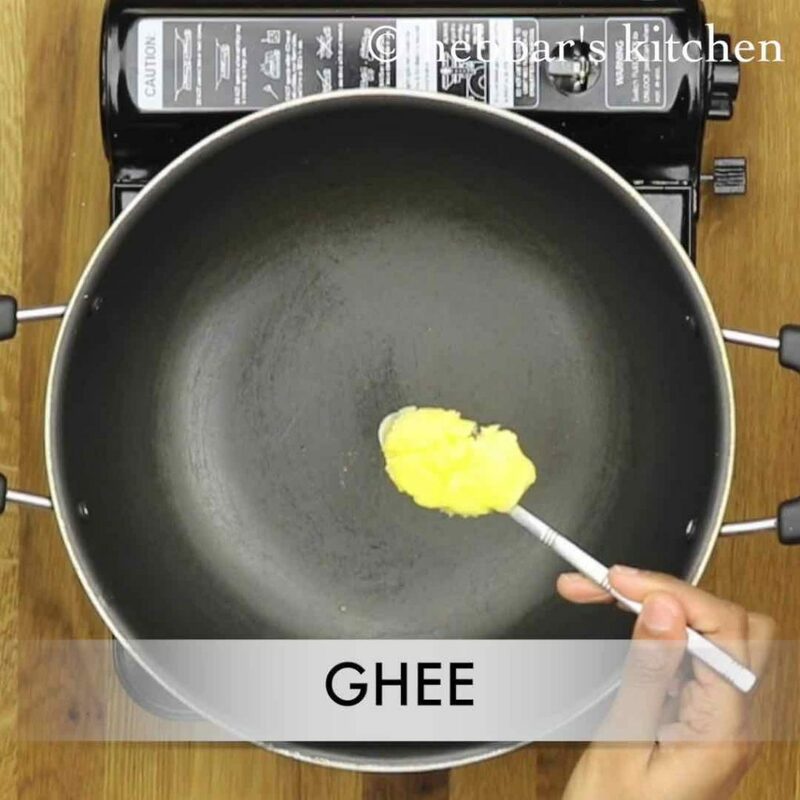 now take a kadai and add a tbsp of ghee. add all the dry fruits like raisins, cashews, pistachios and almonds. fry them on medium flame for 3-4 minutes till they change colour lightly. 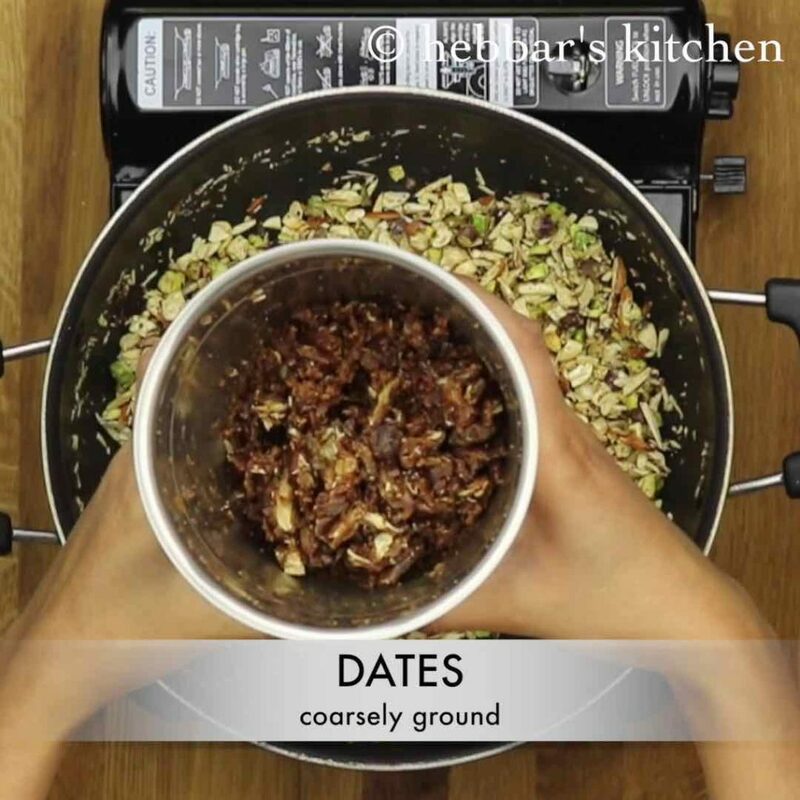 now add coarsely blend dates. continue to fry on medium flame smashing dates with a spatula. 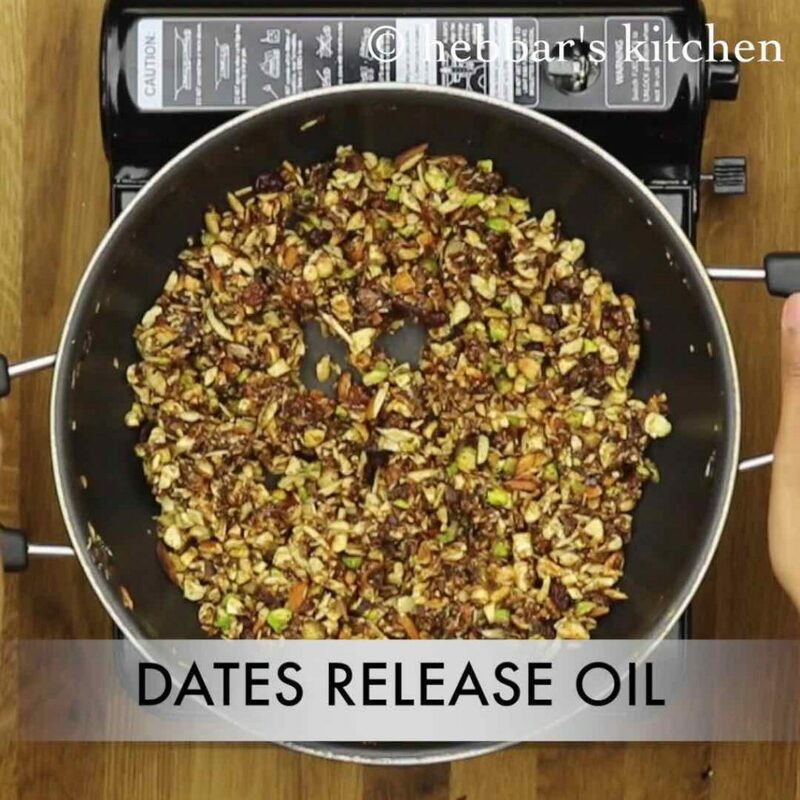 this helps dates to separate out and mix uniformly with other dry fruits. 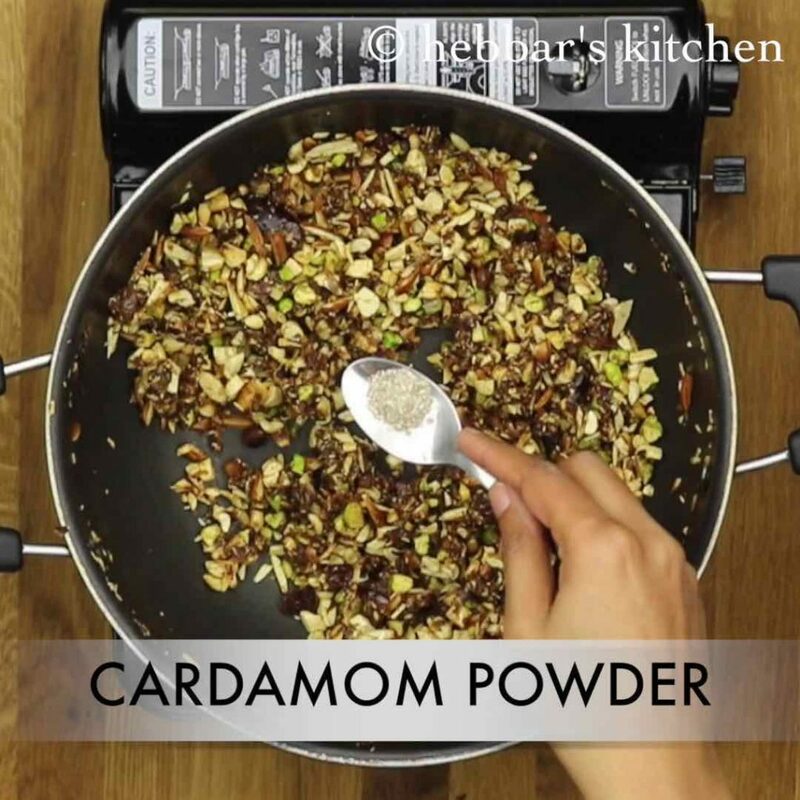 also add cardamom powder and continue to saute. saute till the dates start releasing oil. turn off the flame and allow to cool for a minute or 2.
then immediately start making laddus. do not cool completely, then you wont be able to make laddus. serve immediately or store ladoo in airtight container. 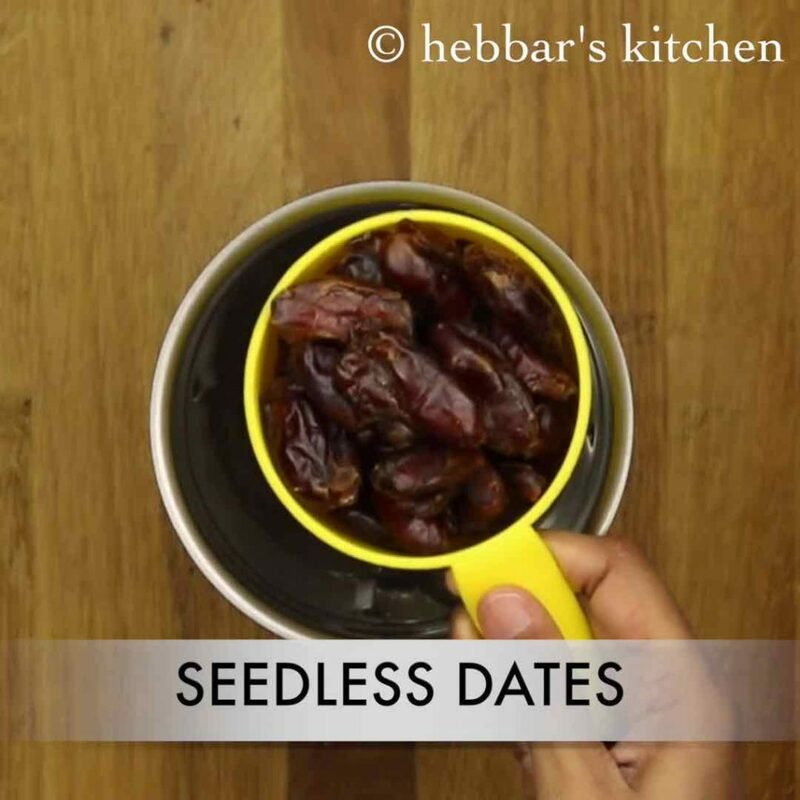 firstly, in a blender take 1 cup of seedless dates and dry blend around 4-5 pulses. 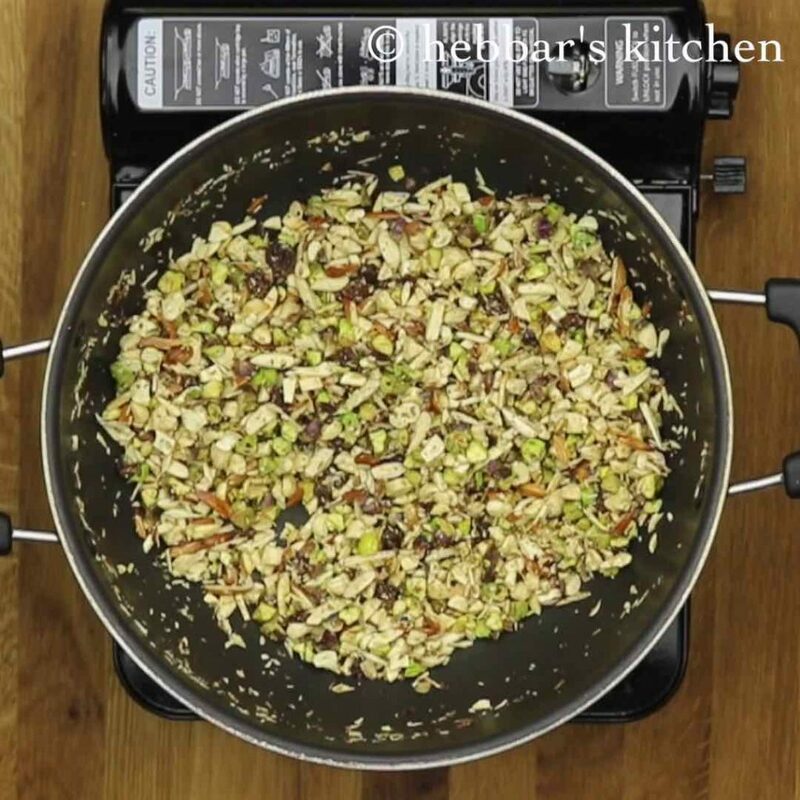 also finely chop cashews, pistachios and almonds. do not powder them as you wont enjoy the crunchy bites. furthermore, take a kadai and add a tbsp of ghee. 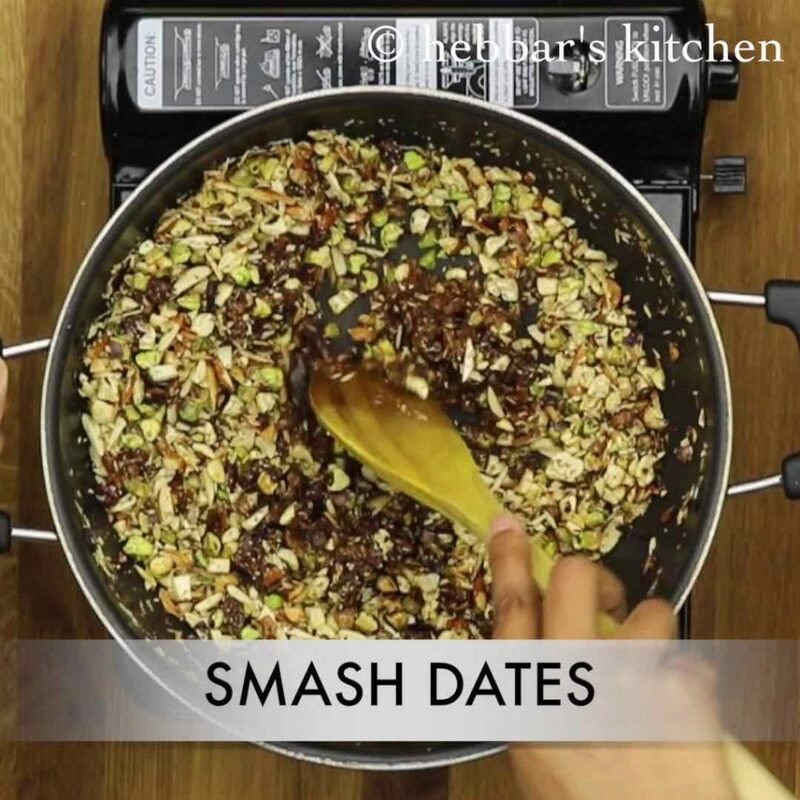 additionally, add all the dry fruits like raisins, cashews, pistachios and almonds. furthermore, fry them on medium flame for 3-4 minutes till they change colour lightly. furthermore, saute till the dates start releasing oil. finally, serve immediately or store ladoo in airtight container. 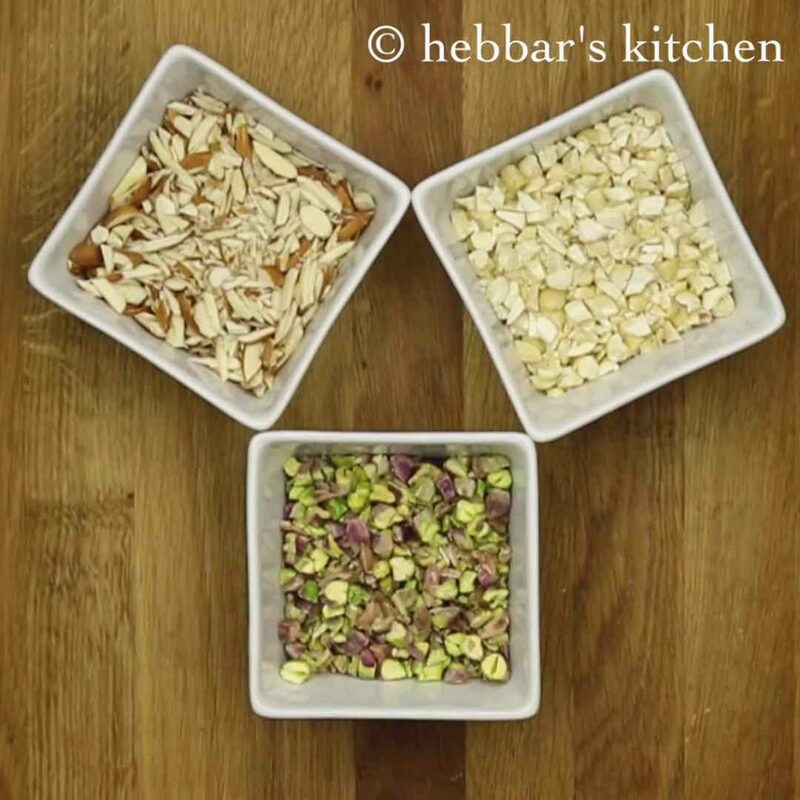 firstly, adjust the proportion of dry fruits as per your choice. furthermore, you can also use coconut, dry figs or nuts of your choice. additionally, increase the proportion of dates if you like it more sweet. also, do not powder the dry fruits as you wont enjoy the crunchy bites. finally, if the mixture cools and you are unable to make laddus then do not worry. you can microwave for a minute or saute on a tawa for a minute till the dates get warm up again. Hi… love all ur recipes. Can i add puffed and crushed gaund and dry roasted coconut in this recipe…? Looks yummy, can u make a vdo where same ingredients are added along with gond, kharik , dry coconut powder & jaggery? Very good recipe..made it for the first time this Diwali and it was a big hit with family and friends.Thank you. hey great recipe but i do have a concern how long can it be preserved? 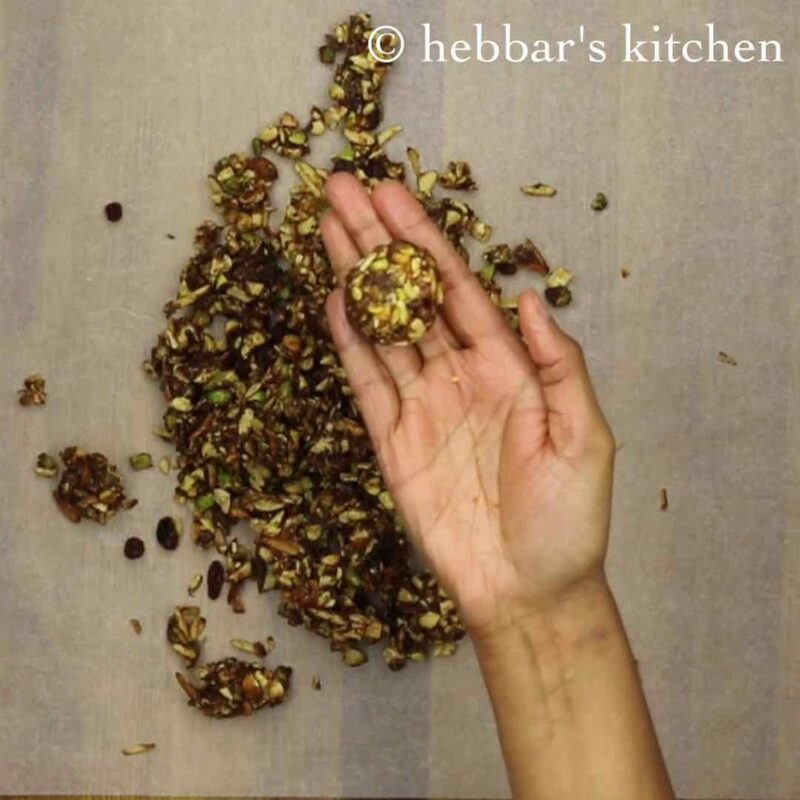 stays good for months as we are dry roasting nuts..
hi ..will i be able to prepare this without roasting them? Very good recipe, i follow ur recipes. Recently prepard milk powder burfi posted by u, it came very well. Will try this ladoo recipe during Ganesh festival for bhoog . I want to coat it with chocolate…can u tell which brand or type of chocolate should i use? And how much of it nd how to go about it? feast for the eyes ! Thanks a lot Priya for such a nice feedback. you can use it but you may have to add jaggery for binding. Just made it! It is Yummy! Hi this recipe is awesome for my baby whom I don’t offer sugar yet. I think I’ll just chop the dry fruits a little finely for her. Could you tell me how many days will this stay fresh and how can I store it? Thank you. thanks a lot for those wonderful comments. I think you should be ok with the essence.